Not all tributes have to do with future Hall of Famers or popular fighters. Monte “Two Gunz” Barrett was a fighter who fought all comers and was truly a boxer who loved fighting. Barrett was never the most-skilled or talented fighter, by any means, but he was impressive in many other ways. He had determination and usually made for an exciting fight. In Saturday’s bout against David Tua, Barrett did what he had done for most of his career -- he defied the odds and nearly pulled off the upset. He knocked Tua down in the last round and had him hurt … not bad for a guy who has only 20 KOs in 44 fights. Barrett never really had much of a “prime.” like other fighters, but he did have a couple of fights where he was getting to be known and being shown on the major networks. Against Joe Mesi in 2003, Barrett was knocked down, but returned the favor and lost a razor-thin decision. Mesi was America’s new heavyweight prospect at the time and Barrett nearly played the spoiler. He did in his very next fight against Dominick Guinn, winning a comfortable decision (surprisingly a split decision). He followed that with a TKO over Owen Beck, another prospect at the time. Barrett also fought Nicolai Valuev in the big Russian’s last fight in the United States. Although Valuev won in the 11th round because of a corner stoppage, it was Barrett who brought the entertainment to the fight, rushing out at Valuev from the opening bell. When he was knocked down in the later rounds, and referee John O’Brien refused to stop the fight, Barrett rose from the canvas each time and continued forward, trying to land something big. Barrett used pink gloves that night, which were auctioned off to raise money for breast cancer. Barrett lost to journeyman Cliff Couser, and although he avenged that defeat, it seemed like he'd had his last hurrah. But he took on the over-hyped, 6-foot-7 Tye Fields. landed a few shots against the ropes in the opening round, and scored the KO. 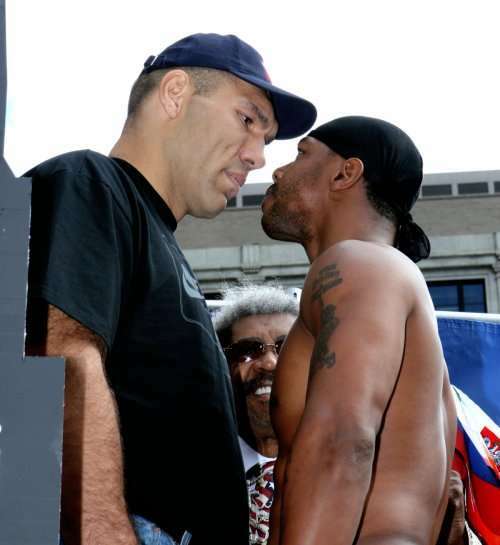 Against Valuev, Barrett charged. Against Fields, he boxed. It’s always been hard not to cheer for a guy like Barrett. a hard worker who just loves to fight. Was he a great fighter? No. Was he one of the top fighters in the sport. or even in the division? Definitely not. But he, and those like him, are what make the sport so interesting. They are the gatekeepers, a step down from the best, a stepping stone for the rising stars. But Barrett often made sure that other fighters did not pass him on the way to the top. Though he was seen as a stepping stone, he was a solid rock -- a rock who was able to send fighters back to Square One as he continued to slowly climb the heavyweight rankings.